This beautiful iconic figurine stands at 8.25″ tall, 3.25″ wide and 3.25″ deep approximately. It is made of designer composite resin, hand painted and polished. This La Pintora is an iconic collectibles depicting a skilled female artist whose legacy lives on way past her lifetime. She is colorful and beautiful, making her a perfect Day Of The Dead figurine to display in your home!!! This beautiful iconic figurine stands at 8.25″ tall, 3.25″ wide and 3.25″ deep approximately. It is made of designer composite resin, hand painted and polished. This La Pintora is an iconic collectibles depicting a skilled female artist whose legacy lives on way past her lifetime. 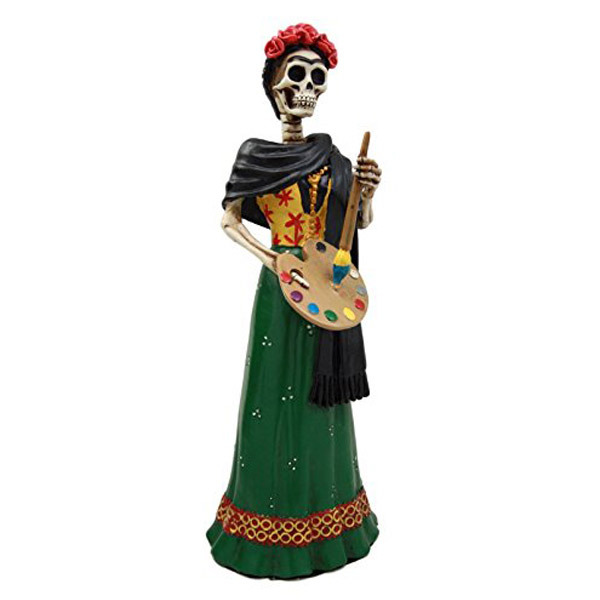 She is colorful and beautiful, making her a perfect Day Of The Dead figurine to display in your home!! !